This sweet white coin pearl is tucked inside a silver pocket of sorts. So cozy! We love how J&I updates the classic pearl necklace. 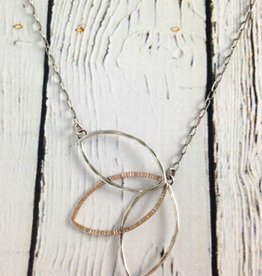 Set upon an oxidized silver chain that can be worn from 16-17.5" and closes with lobster clasp. 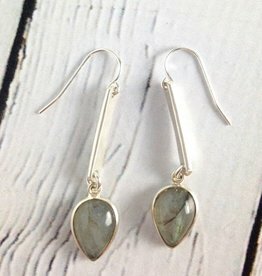 Handmade Labradorite teardrop in sterling bezel and drop earrings. Earrings measure 1.8” long and labradorite stone measures .5” x .35”. Handmade in the Philadelphia studio of J&I. 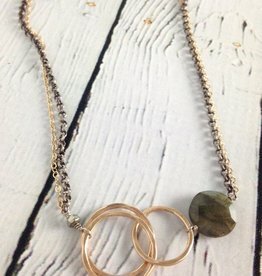 Handmade Hammered 14kt goldfill interlocking circles with 12mm faceted labradorite coin on 19" mix metal chain. 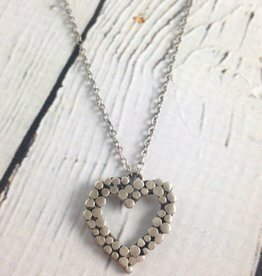 Necklace measures 19” long with 2.5” extension. Labradorite stone measures .5” x .5”. Handmade in the Philadelphia studio of J&I. 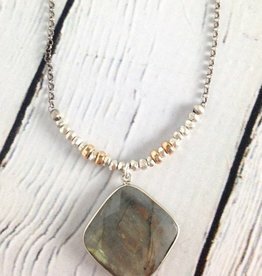 Handmade Faceted cushion cut labradorite pendant on 19” sterling bead and chain necklace. 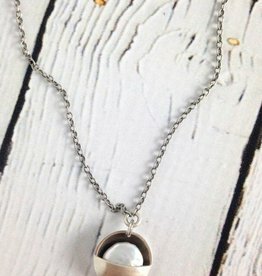 Necklace measures 19” long with 2.5” extension. 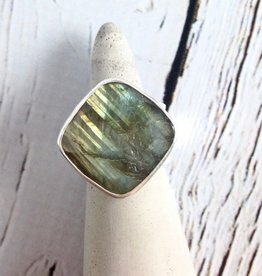 Labradorite pendant measures 1” x 1”. 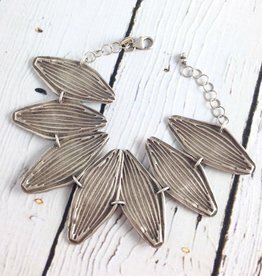 Handmade Open sterling and 14kt Gold Fill leaf fan shape necklace on chain. 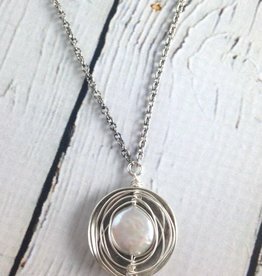 The asymmetry of this necklace's pendant make this piece super unique and it hangs in the prettiest way. 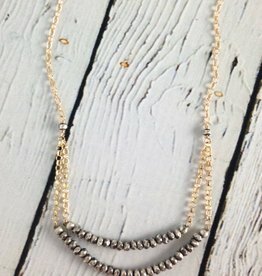 Necklace measures 18" long with 2.5" extension and clasp closure. 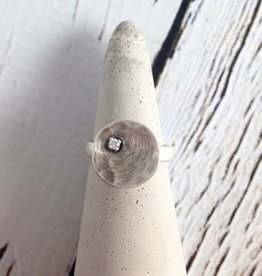 Stone measures approximately 1" x 1". Band of ring is a little over .5" at it's widest part. 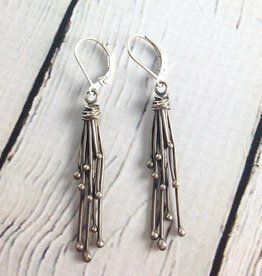 Features about 10 long "sprouts" bundled and hung from sterling ear hooks. 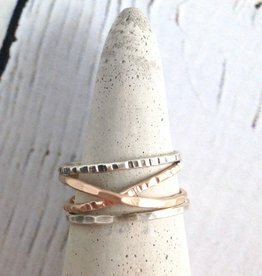 Earrings measure 2.25" long and are approximately 1.5"Hx.25"W.
A dime-sized white coin pearl sits upon a sterling silver wire nest with an oxidized silver disc cupping it. 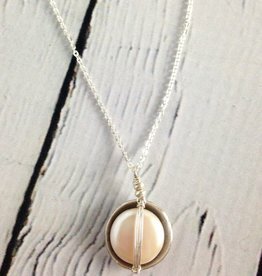 We love how J&I updates the classic pearl necklace. This feels like something a mermaid would wear!